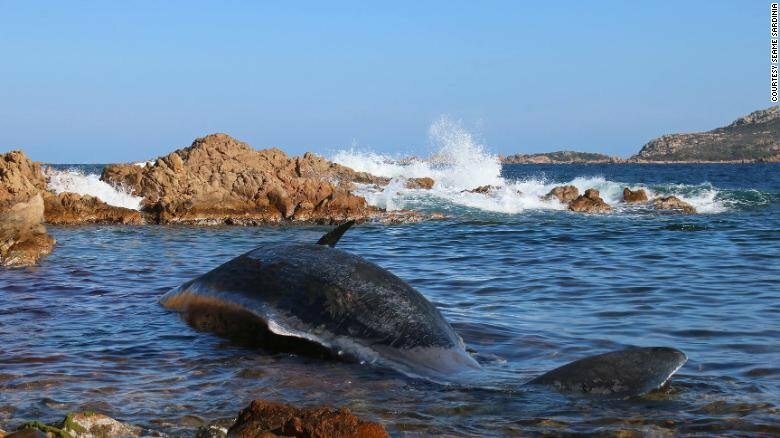 (CNN)The carcass of a pregnant sperm whale that washed up in Sardinia, Italy, last week had 22 kilograms (49 pounds) of plastic in its stomach, and was carrying a dead fetus, the country's environment minister and a marine life non-profit organization said. Luca Bittau, president of the SeaMe group, told CNN the beached mammal's remains contained "garbage bags ... fishing nets, lines, tubes, the bag of a washing machine liquid still identifiable, with brand and barcode ... and other objects no longer identifiable." "She was pregnant and had almost certainly aborted before (she) beached," he said. "The fetus was in an advanced state of composition." Sergio Costa, Italy's environment minister, said in a Facebook post: "Are there still people who say these are not important problems? For me they are, and they are priorities." "We've used the 'comfort' of disposable objects in a lighthearted way in the past years and now we are paying the consequences. Indeed the animals, above all, are the ones paying them," he continued. Slowly but steadily we're wiping all animals and in the end ourselves out because we don't know how to treat out planet because of money and greed.